MexZotic has Career Opportunities designed to support and compliment OUR Retail Partner Business. We have Business & Career options to choose from. We are currently recruiting Retail Agents and Manufacturers Representatives to expand our Business. Contact Party Host and Retailer Partner on a regular basis and advise of new Company Merchandise or Special Promotions. 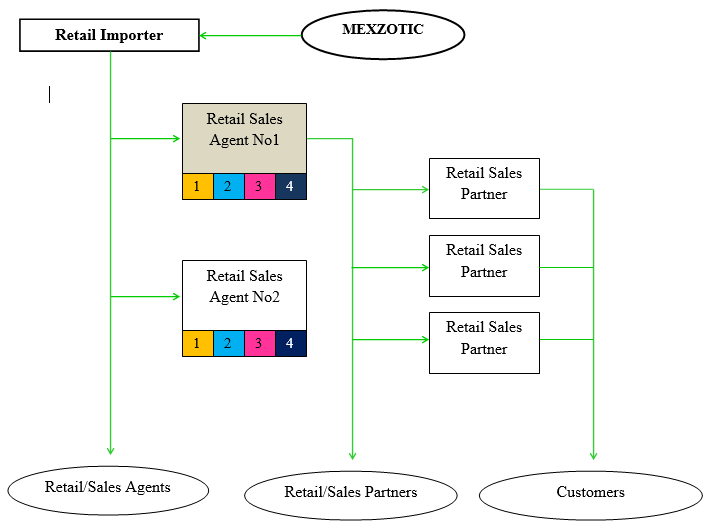 [He or she] will report directly to [Importer Name] and to any other party designated by [MexZotic Name] in connection with the performance of the duties under this Agreement and shall fulfil any other duties reasonably requested by the Company and agreed to by the Retail Agent. We have an innovative upgrade path for our Retail Sales Agent. You will enjoy additional Benefits and Discounts the more you sell via your Network of Retail Partners. Retail Agent – Level 1: Agent is paid ongoing commission of 10% of all Retail Partner Sales Orders. Example: each $5,000.00 Sales Order Value – Retail Agent Commission $500.00. Upgrade: After $5,000 in transacted sales AND/OR appointment of 5 Retail Partners - Retail Agent Level 1 would upgrade to Level 2. Retail Agent – Level 2: Agent is paid ongoing commission of 15% of all Retail Partner Sales Orders. Example: each $5,000.00 Sales Order Value – Retail Agent Commission $750.00. Upgrade: After additional $10,000 in transacted sales AND/OR appointment of additional 10 Retail Partners - Retail Agent Level 2 would upgrade to Level 3. Retail Agent – Level 3: Agent is paid ongoing commission of 20% of all Retail Partner Sales Orders. Example: each $10,000.00 Sales Order Value – Retail Agent Commission $2,000.00. Upgrade: After additional $20,000 in transacted sales AND/OR appointment of additional 20 Retail Partners - Retail Agent Level 3 would upgrade to Level 4. Retail Agent – Level 4: Agent is paid ongoing commission of 25% of all Retail Partner Sales Orders. Example $10,000.00 Sales Order Value – Retail Agent Commission $2,500.00. Upgrade: After Total $100,000 in transacted sales AND/OR appointment of Total 100 Retail Partners - Retail Agent Level 4 can make application to upgrade to Retail Importer. Note 1: Above figures may be amended to include additional Bonuses and Rewards for the Retail Agent as determined by the Company. Note 2: MexZotic reserves the right to appoint and/or upgrade an applicable Retail Agent Level based on experience and/or performance.